Porcupine sedge is a widespread perennial species in North America (USDA 2011). In British Columbia, it is found east of the Coast Mountains. It has, however, appeared sporadically in the Fraser Valley (Lomer 2011). In his write up on the rare plants of the Fraser Valley, Lomer (2011) says: "[In the Fraser Valley] collected from dredged sand in Coquitlam, east of Vancouver (UBC: Lomer 98-183), but this was an impermanent site from preload dumpings prior to building construction. The seed must have been washed down the river from sites in the interior where this rare species is known from the Fraser drainage, among other places. In 2010 a single plant was observed along a sandy meadow shore on an island southwest of Agassiz. So it appears this species can arise naturally from seeds brought down the Fraser River originating from interior plants." Extracted from Botanical Electronic News #432, January 2011, with permission. A detailed description of this species is provided by Ball and Reznicek in Flora North America. A detailed discussion of the genus Carex is also provided. .
Perennial, tufted herb from short, stout rhizomes; stems 15-100 cm tall, as long as or longer than the leaves. Sheaths reddish, the lower ones breaking into threads; blades 3 to 7 per stem, flat, with crosswalls, the margins slightly rolled-under, 2-10 mm wide. Spikes 2 to 5, the terminal one linear, 2-4 cm long, with male flowers, the lower spikes 1 to 4, cylindrical, with female flowers, the lower long-stalked, reflexed, the upper short-stalked, erect; bracts subtending the female spikes tubular-sheathing, leaflike, the lower bracts much longer than the spikes and their stalks, the upper ones progressively reduced. Perigynia lanceolate to narrowly egg-shaped, 5-7 mm long, 1.5-2 mm wide, usually pale greenish, shiny, inflated, convex, smooth above, (12-) 15- to 20-nerved, numerous, separate or crowded, spreading or directed downward, short-stalked, the beaks about 1/2 as long as the bodies, bidentate; the teeth 0.3-0.9 mm long, straight; female scales lanceolate, translucent, much shorter than the perigynia, the midribs extending into rough, tapered awns, the awns 2-6 mm long; stigmas 3; achenes 3-angled, 1.2-1.6 mm long. The original spelling of the name of this sedge was Carex hystericina, the name suggested by C. Schkuhr. L. H. Bailey considered it a grammatical error and corrected it to C. hystricina. This change was accepted by the majority of Carex specialists (Kukenthal, Mackenzie, Fernald, Boivin, Egorova) and it is followed in our treatment as well. H. Muhlenberg's original name for this species was Carex erinacea. 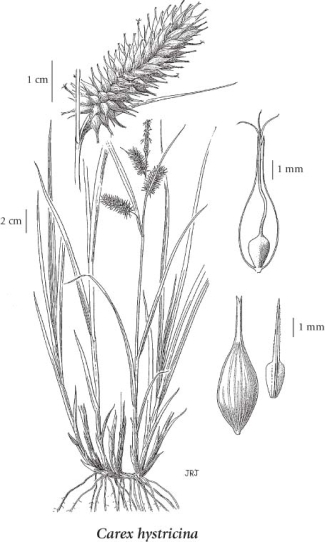 It was Schkuhr who found it necessary to use a different name (Carex hystericina) since C. erinacea had already been used for a different species. Hence the author of the name is C. Schkuhr and not H. Muhlenberg. Swamps, shorelines, streambanks and wet meadows in the steppe and montane zones; rare in BC east of the Coast-Cascade Mountains and S of 56degreeN; E to NF and S to VA, TN, TX, NM, AZ and CA.